What's the Difference Between Tumor and Cyst? Often the words ‘tumor’ and ‘cyst’ are used interchangeably. But there are a number of differences between the two. This refers to a closed sac which contains fluids or air or other material. A cyst is usually soft to touch and can occur anywhere in the body – on the surface of the skin or in the bone or an organ or soft tissue. Most of the cysts are non-cancerous in nature. On the other hand, all cancers can produce cysts. A benign (non-cancerous) cyst can be caused when there’s clogging of glands or an infection in the body. Even though cysts are benign, they can pose problems in some parts of the body like ovaries, if left untreated. This is a mass of tissue which is not normal. It is visible as a hard lump and can form in any part of the body. A tumor can be either benign or malignant (cancerous). If the tumor is formed inside the body, it is visible only in a scan. As long as it’s benign, it does not pose much danger. But it’s important to diagnose it with the help of a doctor. 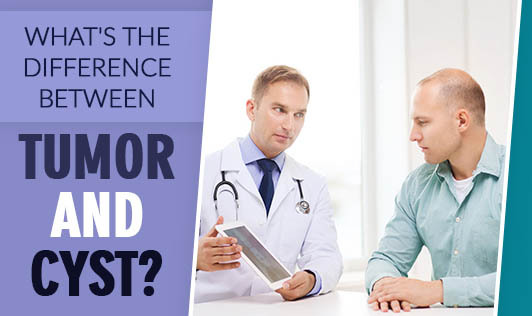 The test conducted to find out whether the cyst or tumor is benign or malignant is called biopsy. This test entails removal of a sample of the tissue and study under a microscope by pathologists.